In this review we provide proofs that “Freedom Circle” is a binary options scam. It is presented by Kyle Stanford. In the Freedom Circle presentation you can hear that we are facing an unprecedented economic crisis, but Freedom Circle can put you on the right side to profit from it. The software allegedly exploits a loophole in the Federal Reserve system and it can make you $1361 every 30 minutes. If you can see the video, you are in one of the 12 countries that can use it. And it’s free. Let’s start with Kyle Stanford. He says that he is an ex-professor of economics, but in fact he does not exist at all. The voice in the video belongs to a paid actor and the photo is a stock photo. Look at the picture on the right to see the proof. On the Freedom Circle web site you can see a counter of time remaining for you to join. But it is a fake one, just reload the page and you’ll see. It is there only to put you under pressure so that you don’t look for real reviews of the Freedom Circle like this one. In the Freedom Circle video you can see testimonials and endorsements from people who allegedly are making money with this program. But they are fake, they were shot with paid actors. Have a look at the picture on the right, you’ll see one example, you can hire the same guy on Fiverr for five bucks. And what about the software that is supposed to make you money? We checked it and it is a binary options software designed and used by scammers only. The picture on the right shows that it is the same app as used by the Profit Maximizer scam. If you use it, you will lose money that you will have to deposit. Because Freedom Circle is not free, you will have to deposit at least $250 to be allowed to use it. So you will be risking and losing your own money with it since the first trade. These scammers push you to open an account and deposit money with Opteck, because they will get paid by Opteck if you do that. It is the only purpose of the Freedom Circle scam. The trading software is so bad that it will lose your money if you trade with it. 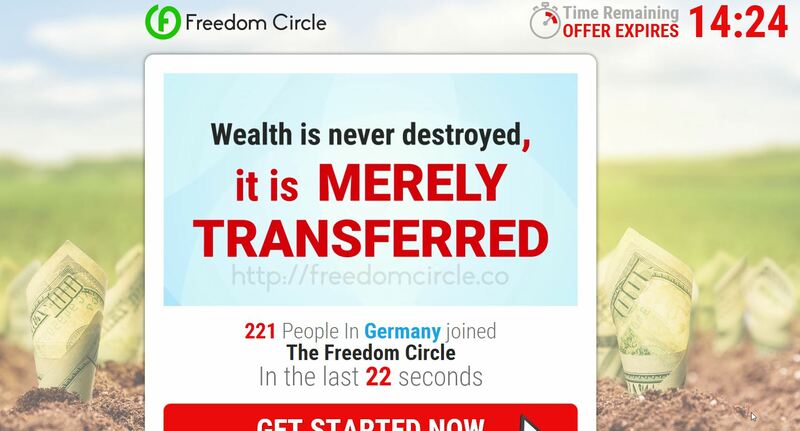 Freedom Circle is just another scam that abuses binary options. The software is losing money, so don’t use it. Instead you can try manual trading on a free demo account to see how real money can be made in binary options trading. But it requires learning and testing.